Pyruvate carboxylase deficiency (PCD) is a rare disorder that can cause developmental delay and failure to thrive starting in the neonatal or early infantile period. Pyruvate carboxylase deficiency results in malfunction of the citric acid cycle and gluconeogenesis, thereby depriving the body of energy; the former biochemical process derives energy from carbohydrates, whereas the latter produces carbohydrate fuel for the body when carbohydrate intake is low. See the image below. 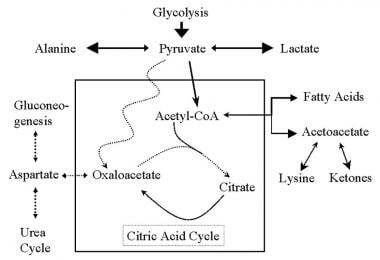 This is a diagrammatic representation of the citric acid cycle and the abnormalities found in pyruvate carboxylase deficiency. The dotted line represents absent pathways. Pyruvate cannot produce oxaloacetate and is shunted to alternative pathways that produce lactic acid and alanine. The lack of oxaloacetate prevents gluconeogenesis and urea cycle function. Metabolic acidosis caused by an abnormal lactate production is associated with nonspecific symptoms such as severe lethargy, poor feeding, vomiting, and seizures, especially during periods of illness and metabolic stress. In the most severe form, pyruvate carboxylase deficiency results in progressive neurologic symptoms, starting in the neonatal or early infantile period, include developmental delay, poor muscle tone, abnormal eye movements, or seizures. Therapies can ameliorate the biochemical abnormalities but cannot undo the progressive neurologic damage. Pyruvate carboxylase (PC) is a biotin-dependent mitochondrial enzyme that plays an important role in energy production and anaplerotic pathways. [1, 2] PC catalyzes the conversion of pyruvate to oxaloacetate. Oxaloacetate is 1 of 2 essential substrates needed to produce citrate, the first substrate in gluconeogenesis (see the image below). The production of citrate, the first substrate in the citric acid cycle, is limited, thus preventing the citric acid cycle from proceeding. The precursor of oxaloacetate, pyruvate, is shunted towards alternate metabolic pathways, leading to an increase in lactic acid, alanine, and acetylcoenzyme A (acetyl-CoA). Acetyl-CoA cannot produce citrate without oxaloacetate and is shunted to produce ketone bodies. Gluconeogenesis cannot proceed without oxaloacetate, resulting in hypoglycemia during times of prolonged fasting. Tissues that are solely dependent on glucose for fuel, such as the brain, are severely compromised during fasting states. Because cells cannot use the citric acid cycle to produce energy, energy is extracted from glucose exclusively through glycolysis. The highly inefficient process of glycolysis causes glucose to be degraded at a very high rate, resulting in a glucose deficit, thereby compounding the problem. Aspartic acid, which is derived from oxaloacetate, is required for the urea cycle. A decrease in aspartic acid production reduces ammonia disposal and leads to increased serum ammonia levels. PC also has a role in lipogenesis in adipose tissue. Type A: The North American phenotype is characterized by infantile onset, moderate lactate level elevation, normal lactate-to-pyruvate ratio, global developmental delay with mental retardation, and survival until adulthood. Type B: The French phenotype is characterized by neonatal onset, high lactate and ammonia levels, abnormal lactate-to-pyruvate ratio, and death within the first few months of life. Type C: The benign phenotype is characterized by recurrent episodes of mild-to-moderate lactate elevation without any neurological or cognitive symptoms. Pyruvate carboxylase deficiency is a rare disorder, with an approximate incidence of 1 in 250,000 births. Infantile-onset pyruvate carboxylase deficiency (A type) is more common in the United States. An increased incidence has been documented among certain populations, most notably native North American Indians who speak the Algonquian dialect. A founder effect has been postulated. Neonatal onset pyruvate carboxylase deficiency (B type) has a higher incidence in France. Most patients with type B pyruvate carboxylase deficiency die within the first 6 months of life. Some therapies may reduce the biochemical dysfunction. However, progressive neurologic deterioration results in significant morbidity. Severe energy deficit in the CNS causes neurologic symptoms and congenital brain malformations due to a lack of energy during neurogenesis. In neonates with apparently normal brains, progressive neurologic deterioration varies. Hypomyelination, cystic lesions, and gliosis of the cortex or cerebellum with gray matter degeneration or necrotizing encephalopathy occur in some infants. Others develop Leigh syndrome, which is a gliosis of the brainstem and basal ganglia with capillary proliferation and characteristic changes on CT scanning and MRI. Most patients with the type A pyruvate carboxylase deficiency live into adulthood but have global neurological and cognitive dysfunction. The age of presentation for the most serious forms varies from the prenatal period to early infancy. Severe disease has prenatal onset and is associated with congenital brain abnormalities. Type A pyruvate carboxylase deficiency manifests in early infancy. The benign form manifests as periods of lactic acidosis anytime during life. Monnot S, Serre V, Chadefaux-Vekemans B, et al. Structural insights on pathogenic effects of novel mutations causing pyruvate carboxylase deficiency. Hum Mutat. 2009 May. 30(5):734-40. [Medline]. Ostergaard E, Duno M, Møller LB, Kalkanoglu-Sivri HS, Dursun A, Aliefendioglu D, et al. Novel Mutations in the PC Gene in Patients with Type B Pyruvate Carboxylase Deficiency. JIMD Rep. 2013. 9:1-5. [Medline]. [Full Text]. Marin-Valencia I, Roe CR, Pascual JM. Pyruvate carboxylase deficiency: mechanisms, mimics and anaplerosis. Mol Genet Metab. 2010 Sep. 101(1):9-17. [Medline]. De Meirleir L. Disorders of pyruvate metabolism. Handb Clin Neurol. 2013. 113:1667-73. [Medline]. Al-Essa MA, Ozand PT. Manual of Metabolic Disease. 1st ed. Riyadh, Saudi Arabia: King Faisal Specialist Hospital and Research Centre; 1998. Augereau C, Pham Dinh D, Moncion A. Pyruvate carboxylase deficiencies: complementation studies between "French" and "American" phenotypes in cultured fibroblasts. J Inherit Metab Dis. 1985. 8(2):59-62. [Medline]. Bartlett K, Ghneim HK, Stirk JH. Pyruvate carboxylase deficiency. J Inherit Metab Dis. 1984. 7 Suppl 1:74-8. [Medline]. Garcia-Cazorla A, Rabier D, Touati G, Chadefaux-Vekemans B, Marsac C, de Lonlay P. Pyruvate carboxylase deficiency: metabolic characteristics and new neurological aspects. Ann Neurol. 2006 Jan. 59(1):121-7. [Medline]. Higgins JJ, Glasgow AM, Lusk M. MRI, clinical, and biochemical features of partial pyruvate carboxylase deficiency. J Child Neurol. 1994 Oct. 9(4):436-9. [Medline]. Mochel F, DeLonlay P, Touati G, Brunengraber H, Kinman RP, Rabier D. Pyruvate carboxylase deficiency: clinical and biochemical response to anaplerotic diet therapy. Mol Genet Metab. 2005 Apr. 84(4):305-12. [Medline]. Nyhan WL, Khanna A, Barshop BA. Pyruvate carboxylase deficiency--insights from liver transplantation. Mol Genet Metab. 2002 Sep-Oct. 77(1-2):143-9. [Medline]. Perry TL, Haworth JC, Robinson BH. Brain amino acid abnormalities in pyruvate carboxylase deficiency. J Inherit Metab Dis. 1985. 8(2):63-6. [Medline]. Robinson BH. Lactic acidemia and mitochondrial disease. Mol Genet Metab. 2006 Sep-Oct. 89(1-2):3-13. [Medline]. Schiff M, Levrat V, Acquaviva C, Vianey-Saban C, Rolland MO, Guffon N. A case of pyruvate carboxylase deficiency with atypical clinical and neuroradiological presentation. Mol Genet Metab. 2006 Feb. 87(2):175-7. [Medline]. Stacpoole PW, Barnes CL, Hurbanis MD. Treatment of congenital lactic acidosis with dichloroacetate [see comments]. Arch Dis Child. 1997 Dec. 77(6):535-41. [Medline]. Ullrich K, Schmidt H, van Teeffelen-Heithoff A. Glycogen storage disease type I and III and pyruvate carboxylase deficiency: results of long-term treatment with uncooked cornstarch. Acta Paediatr Scand. 1988 Jul. 77(4):531-6. [Medline]. Van Coster RN, Janssens S, Misson JP. Prenatal diagnosis of pyruvate carboxylase deficiency by direct measurement of catalytic activity on chorionic villi samples. Prenat Diagn. 1998 Oct. 18(10):1041-4. [Medline].